Just saw an astonishing solo show at TheaterJ in Washington. 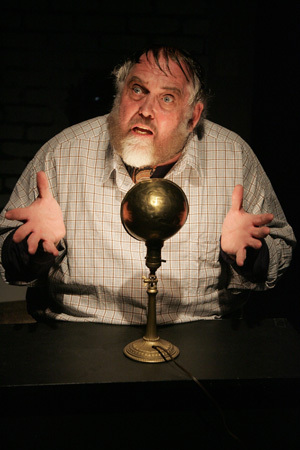 Called Zero Hour, it is a wonderfully-written and fantastically-performed celebration of the life of Zero Mostel. I must admit, I mainly know about Mostel in the way that in the show he says he most hated: The fat guy in The Producers. Turns out he was a huge character in the theatre world of the US, absolutely hilarious (cracking gag about a tea-pot, you had to be there), and his life story is overwhelming. Most powerful and evocative was his tale of the McCarthy era. Mostel was out of work for 10 years due to the Un-American Committee’s efforts, and saw his best friend disintegrate into suicide. I was struck by several aspects of this story. First, I was shaken by the Mostel character’s description of the McCarthy era not as a witch-hunt, but as the American Inquisition of the Jews. Lucille Ball was brought before McCarthy’s committee when they had her Communist Party membership card in their hands, but she, blonde and wasp as she was, was let off with a rap on the knuckles. According to Zero Hour, communists were not sought who happened to be Jewish. Rather Jews were sought who happened to be communist. It wasn’t all that long ago. Third, after chatting with Ari Roth, TheaterJ’s courageous and thoughtful artistic director, I was left thinking about boycotts and blacklists in the Jewish world. On the one hand, it would seem that Israel is soon to be on the receiving end of an international boycott. This boycott, which is likely to hit the more left-wing of Israel’s population and play into the fantasies of most of the right-wing, feels somewhat ill-thought-out. On the other hand, within the North American Jewish community if not a boycott then perhaps a blacklist of our own would seem to be developing. Jewish organizations, and in particular Jewish arts organizations that do not tow a specific political line on Israel, are being punished through boycotts, pickets, and withdrawal of funding. The coming months and years are going to be interesting to watch in the States. Seen through the prism of Zero Hour, I can see how a Jewish community that once fell victim to censorship and blacklists might be expected to fight them with all their might. On the other hand, Jews in the US are Americans, and Americans, underneath it all, are maybe not such pure democratic freedom-of-speechers as one might expect.